Safetech's Free Standing Articulating Jibs, available from Total Lifting Solutions , can rotate up to 360° on the primary boom and 330° on the secondary boom (depending on hoist dimension). Articulating Jib Cranes provide a rapid return on investment through increased productivity, reduced injuries, and improved safety. Increases in production result from the easy rotation of the boom and quick, precise load positioning. Injuries are reduced and safety improved since only a low force is required to start and stop the boom rotation. Ergonomic design makes for superior ease of movement and precise positioning. Traditional jib cranes can be difficult to rotate when the load is on the inner half of the boom. The articulating jibs are easier to rotate in close to the free standing mast or building column. Articulating Jib Cranes are available as standard products in capacities to 400kg (max 2400 span) and spans up to 4,800mm (max 200kg) without the extra lead time and costs associated with customization. A structurally adequate foundation is needed to support the AJ360-F Articulating Jib Cranes. 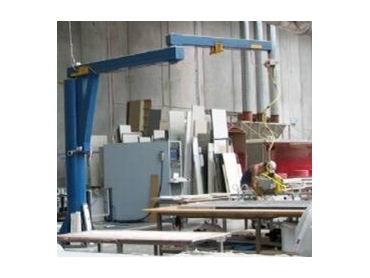 Articulating Work Station Jib Cranes are available in three different mounting styles to meet your application needs. The AJ360-available as a free standing or Mobile Base articulating jib. The AJ200 is a wallmounted option. Ideal when it comes to positioning and spotting loads around an obstruction, through an open doorway, or rotating in close to the free standing mast. Rotation stops for primary boom. Rotation stops for secondary boom.